This story—which is tragic on many levels—can nevertheless help us to think about several questions that often arise in the brotherly debate between those who believe in eternal conscious torment and those who believe in annihilationism. Specifically, I would like to draw out three lessons. The shooting of Harambe, while tragic, was justified because the life of the little boy is much more valuable than the life of the gorilla. If a pet dog had fallen into the exhibit, it would not have been right to shoot the gorilla. This points to the truth that whom you sin against does make a difference. Traditionalists try to explain how it could be right for God to torture people for a trillion years, and then keep going forever, even though they had only sinned for eighty or ninety years. Perhaps the most common explanation given is that sinning against a being of greater worth deserves greater punishment. The argument continues by saying that since God is of infinite worth, sins against Him deserve infinite punishment. This argument was recently addressed by Joseph Dear. 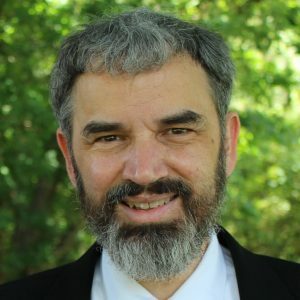 In this post I will repeat a little of what he shared, but mainly add some additional thoughts. Like Joseph and many other conditionalists, I agree that the worth of the one sinned against is a factor in determining how serious a sin is. The Bible does not explicitly teach this point as far as I can tell, but it does seem to be implied by several Bible passages. For example, this principle seems to be implied in Malachi 1:8-14 when God argues that since the priests would not bring blemished sacrifices to a human governor, much less should they bring them to Him. This principle also seems to be implied by the fact that the greatest commandment is to love God. This command is specifically stated to be “first,” while the command to love people is “second” (Matthew 22:36-39). But to state that sinning against God is more serious than sinning against other humans, at least in some ways, is still a long way from proving that eternal conscious torment is the punishment that God should and will mete out to unbelievers. Going back to Harambe, if somehow the boy had been rescued without killing the gorilla, no reasonable person would argue that Harambe should be tortured for the next ten years because he dragged the boy around the moat and caused the boy some injuries. This brings us to the next lesson . . . When Harambe dragged the boy and caused him some injuries, Harambe was doing something to him that is considered wrong. Yet, no one wanted him to be shot. 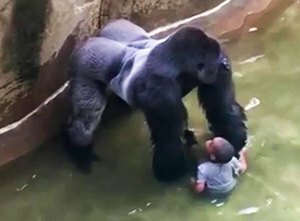 Had the boy been rescued without him being shot, no one would have wanted to punish Harambe. Why not? Because as far as we can tell, Harambe was not knowingly doing anything wrong. If a little boy was dragged around by a strong adult man and injured, we would all agree that he deserves severe punishment. But Harambe probably did not intend to harm the boy. We understand that ignorance does not make a wrong act right. However, ignorance does mitigate the seriousness of a sin and therefore reduces the punishment that is deserved. This same principle is also seen when we consider the four-year-old. Does he deserve punishment for entering a prohibited area? If he did, then I think we would all agree that the injuries he received are already more than enough. If he had gotten out of the enclosure without harm of any kind, we might agree that some form of correction from his parents would be called for, but nothing severe. What he did was wrong, yet he could not understand at his age how serious his actions were. But what if an adult had leaped into the exhibit for no good reason and Harambe was killed to save them? If the adult got out without injury, we would agree that some type of significant punishment (perhaps jail and a very large fine) would be called for. So, we see again that the level of understanding of the sinner affects the seriousness of sin and the severity of punishment. The servant who knows the master’s will and does not get ready or does not do what the master wants will be beaten with many blows. If a bull gores a man or woman to death, the bull is to be stoned to death, and its meat must not be eaten. But the owner of the bull will not be held responsible. Finally, we see the principle at work in the heartfelt cry of our Lord from the cross: “Father, forgive them, for they do not know what they are doing” (Luke 23:34, NIV). So, on the one hand, people sin against God, Who is far greater than any created being. This makes our sin very serious. In a way, all of our sins are sins against God, which makes them far weightier than people usually realize. On the other hand, human beings struggle to understand God’s greatness. This is especially true for those who are not saved and therefore know less of God’s glory. In a sense, unbelievers are sinning with a degree of ignorance. This factor mitigates the weight of their sin. The amount of conscious suffering is finite. This is seen when Jesus describes people receiving either “many blows” or “few blows.” We don’t know how many blows “many” and “few” are, but it’s a lot less than infinite! God has given us a conscience that warns us of the ultimate penalty our sin deserves. While a person’s conscience can be ignored and damaged, it is not completely obliterated. God tells us that “Although they know God’s righteous decree that those who do such things deserve death, they not only continue to do these very things but also approve of those who practice them” (Romans 1:32, NIV). The Bible clearly and repeatedly teaches that the final fate of the unrighteous is to perish (John 3:16), be destroyed in both body and soul (Mathew 10:28), be burned to ashes (2 Peter 2:6), and to die a second time (Revelation 20:14). We are given very little information about the nature and amount of conscious suffering that the unsaved will endure when they perish. But I think that the Bible does indicate that this suffering will be proportional to a person’s sin and that one factor to be considered is how much of God’s will a person knew. However, the punishment for sin is not conscious suffering per se, but rather an eternal death sentence (Romans 6:23), where suffering can occur while it is being carried out. As many conditionalists have pointed out, as well as some traditionalists, being dead forever is a form of eternal punishment because the unsaved suffer the loss of eternal life and joy. So, yes, sinning against our great God is extremely serious and brings terrible consequences, including such eternal loss. But no, sinning against God does not warrant being tortured forever. As we’ve seen, this rests not on opinion or speculative argument, but on God’s revealed truth.